A historic New England country inn, lovingly restored—complete with rocking chairs on the veranda and a cupola—The Norwich Inn is home to a microbrewery and a pub and restaurant serving a farm-fresh Vermont menu. Guestrooms are in 3 buildings: the historic Main House, which also houses the restaurant and pub, and two new buildings: Ivy Lodge and Walker House. Rooms in Ivy Lodge and Walker House reflect the character of the inn with wainscoting and traditional furniture. Main House rooms are pure Victoriana: think William Morris-style floral wallpaper and four-poster beds. Pet friendly rooms are available in Ivy Lodge. Dine in the friendly, casual Pub, or the more formal dining room; terrace seating is available in fine weather. The menu features Vermont produce and game, and the housemade ale makes star appearances in many of the dishes. The wine list is one of the largest in the state—there's a cellar dining room with a fireplace for private parties. 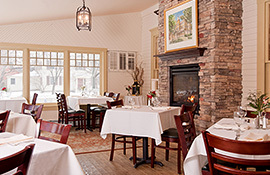 The Inn is minutes from Dartmouth College, Dartmouth-Hitchcock Medical Center and King Arthur Flour.